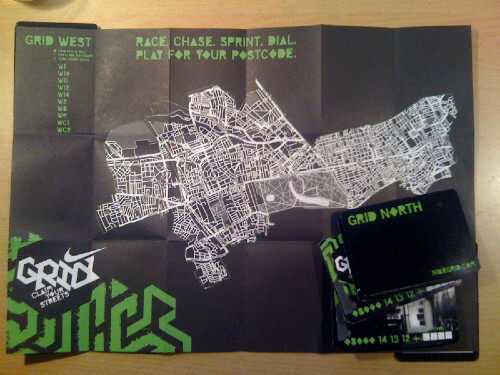 Nike are running an event next Friday/Saturday in inner London called Nike Grid. It’s a great idea – basically players run between any two specially marked phoneboxes in a postcode area (e.g. E9). Typically there are 3 or 4 such phoneboxes in each area, each temporarily branded with the event logo. At the beginning and end of the leg, the player phones a special number from the phonebox, entering their player code. As the call comes from the phonebox, it’s proof that the player is there then. Players then earn badges by doing the most number of runs in a postcode, doing all the possible combinations, the fastest run, the hilliest run, etc. Like I say, a great idea. It’s a technologically advanced version of street orienteering, similar to what my club has been running in similar locations in central London over the winter and it’s a shame that Nike doesn’t mention the “o” world anywhere in their publicity for the event – but maybe orienteering is a bit anoraky for their brand experts? (Nike don’t make orienteering shoes anyway, but their big rivals, Adidas, do – my current o-shoes are Swoop 2s.) It’s a missed opportunity to promote the (sub)-sport to a market that likes running, is happy to be holding a map as a different challenge, but has never heard of orienteering. On the left is part of the map my club used for a street-o in Bow, below it is Nike’s version. To pick your way between phoneboxes, you get a map – downloadable from the website, or collectable in paper form from the phoneboxes themselves or the Nike stores in London. There’s four maps, representing south, west, north and east London – the coverage generally extends out to the edge of zone 2. I visited a few of the phoneboxes this evening and picked up the north and the west maps (the south and east ones haven’t been put out yet, or have all been swiped already). On the maps, the phoneboxes are shown as green hexagons and the rest of the map is a rather pleasingly mimimalistic white-on-black design, rather like some of the other great cartography you can create out of the OpenStreetMap data for inner London that I and other project volunteers have collected. In fact, wait a minute. Some of the detail on the maps around my home area looks rather familiar. Yes, they have actually used OpenStreetMap data for the map. I can see the characteristic kinks in the paths in my local park that I surveyed and that don’t appear on OS/Google/Teleatlas/Navteq et al map data. Nothing wrong with that – using OpenStreetMap data commercially such as promoting a brand of shoes is just fine. Except they haven’t attributed the project or stated the licence the maps fall under – both requirements of using OpenStreetMap data to create a derived work, especially in printed form. Oops. Why am I bothered? Contributors of open data don’t do it for the money (mostly) but for the “kudos”. In the case of OSM, the project itself typically gets attributed rather than specific contributors, for practical and logistical reasons. The contributors are still acknowledged in the data itself. The project benefits from acknowledgement because publicity will help increase the number of contributors to the project and so increase the quality and completeness of the map data, making it in turn more viable for future uses. Everyone wins. All they need to do is (a) add a line to attribute the project, such as “Map data (c) OpenStreetMap and contributors, CC-BY-SA”, to the maps concerned on their website and future printed copies, and (b) not be surprised if people make derivative works from the maps, which is allowed by the licence the data has been used under. I’m tempted to create an interactive map for the whole of London or indeed the world, in the same style – the cartography is very nice. Incidentally the map is created using quite an old copy of the data, from before last September – some of the more recent roads I and others have added to the project don’t appear. The designers have also enhanced the widths of some of the major roads, and added in road names and numbers. Roundabouts have also been added in as proper circles. There are some mistakes in the process they’ve used – the main track (highway=bridleway if I recall correctly) around Victoria Park doesn’t appear, but the paths (highway=path) that lead to it do, resulting in a rather odd “gappy” looking bit of cartography around there, ironically a similar quirk of the Google maps of the same area. Also, I’m not sure where the postcode boundary lines come from, but they mis-align somewhat with the OpenStreetMap data – in some places the lines wander near, but not exactly along, the centreline of a boundary road. You can see a particularly bad mismatch between the green line (postal boundary) and the white line (here a canal) on the left of the first map above. Just a cosmetic quirk. It is a really great idea, and a really nice bit of marketing. I will, hopefully, have a go at getting a few of the badges during the 24 hours the game runs. Let’s hope they get the attribution sorted out. By the way, Nike have made it very hard to be contacted about this – there are no contact details on the game’s website and it is not possible to send private messages to the owner of the game’s page on Facebook, thanks to the way the social network sets up fan pages. Sigh. Of course, people in glass houses and all that, I should attribute the screenshots in this blog post – all the screenshots are of maps created using map data (c) OpenStreetMap and contributors, CC-BY-SA. It’s a real shame that Nike haven’t taken the time to attribute the data correctly. It should be taken as a compliment that OSM data is being used for “mainstream” events organised by large companies but without correct attribution this fact is meaningless. Lets hope that Nike fix their oversight ASAP. It’s such a shame when this kind of thing happens, but I haven’t heard of a Creative Commons lawyer—nor have I ever seen one practising. It would be nice if they attributed us next time around; I wish their projects well, as I do with most people’s works. 😛 To be honest, doesn’t take that much room / that long to attribute OSM. It’s really cool they used openstreetmap data, let’s try not to scare them away and just suggest it would be nice to get credit. I’d also suggest “Data (c) osm.org” or something short like that, rather than the full version as this is really difficult to add to some designs. Despite I like the fact that OSM data was used for this, meaning that it’s increasingly being considered a reliable source of information, I’m really sad about what should be considered a simple act of honesty. But yeah, I do agree with Andrew: let’s not scare them and suggest we’re very happy for them to use OSM data, possibly giving attribution credits next time. How Nike forgot to mention the openstreetmap (osm) licence when using map data from the community ? Grid did not attribute our paper maps to the open source mapping community, whose software we used. Our mistake. We should have done. Credit where credit is due. Thanks to: Map data (c) OpenStreetMap and contributors, CC-BY-SA for helping to make London a gameboard. Hi Sean, I only saw your comment now – sorry! Nike are being more organised this time and did sort out the attribution.